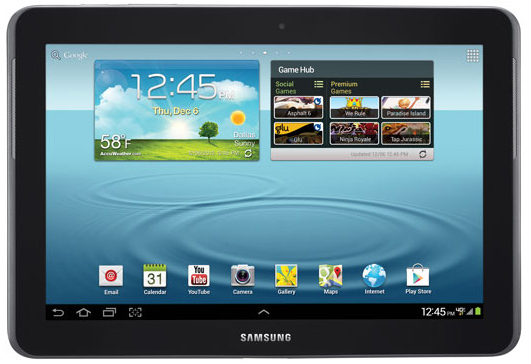 The following guide is made to root Samsung Galaxy Tab 2 GT-P3113 tablets running on the Android 4.0.4 software update. You can only follow this guide if you have the Samsung Galaxy Tab 2 with the model number GT-P3113. Find out your Tab 2’s model number by tapping on the Menu > Settings > About Device > Model Number. You must have a computer that is running a version of Windows from XP or above to follow this guide. The Odin flashing tool will not work unless it’s running on Windows. The CF-Auto-Root file you will find in this guide is based on the Android 4.0.4 software update and IMM76D.P3113UEBLH2 firmware. You do not need to be running the firmware with that same build ID, but you should use it as an indicator for your own. Some Samsung smartphone and tablets will not boot the older images. Download the Samsung USB Drivers  for the Samsung Galaxy Tab 2 device and install them on the computer you are using for the guide. You want those drivers running before you start the steps otherwise you might not have success rooting the Samsung Galaxy Tab 2 tablet. Enable the Developer Options by tapping on the Galaxy Tab 2’s Menu > Settings > About Device > Build Number 7 times. Enable the USB Debugging Mode on the Tab 2 by tapping on the Menu > Settings > Developer Options > USB Debugging Mode. Download the updated CF-Auto-Root package for the P9113 version of the Tab 2 from this link . Download the Odin flash tool for the Tab 2 from this link . Download and extract the files on the desktop of the computer. You do it by right-clicking the file > extract here. Run the Odin flashing tool by double-clicking over the same. Turn off the Samsung Galaxy Tab 2 by long-pressing the Power button for about 10 seconds. Reboot the Samsung Galaxy Tab 2 tablet in download mode. Connect the Samsung Galaxy Tab 2 device to the computer with the USB cable that you use for charging the battery. Click the PDA or the AP button that is available from the flashing tool’s user-interface and browse the desktop location for the CF-Auto-Root-espressowifi-espressowifiue-gtp3113.tar.md5 file. Do not make any other changes to the Odin flashing tool’s user-interface. Click the Start button and wait for Odin to flash the rooting exploit on your Samsung Galaxy Tab 2 that fully enabled and install SuperSU. Look at the display of the Samsung Galaxy tab 2 tablet and wait until it says the device is about to reboot in 10 seconds. Any device that does not reboot into the recovery mode will need to get there manually for the rooting to complete. For those who need it, you can get in recovery mode by pressing the Volume Up + Home + Power keys during the booting process, but never when the tablet is already powered on. Due to some software updates likely arriving in the future, Chainfire will need to upload the file with a new bootloader, since the newer firmware can sometimes bring new bootloaders with it. When the bootloader files is not yet updated and you attempt to root the device, it can get stuck and fail to boot or flash. You can report those problems to Chainfire at the official XDA Developers thread  that is made for his CF-Auto-Root tool and he will soon update the file so it works again.